Hopscotch Coffee and Records in Winchester. Image by Winchester-Frederick County Tourism. These guys know their coffee; in fact that’s what dominates their menu, addition to a few small pastry offerings. 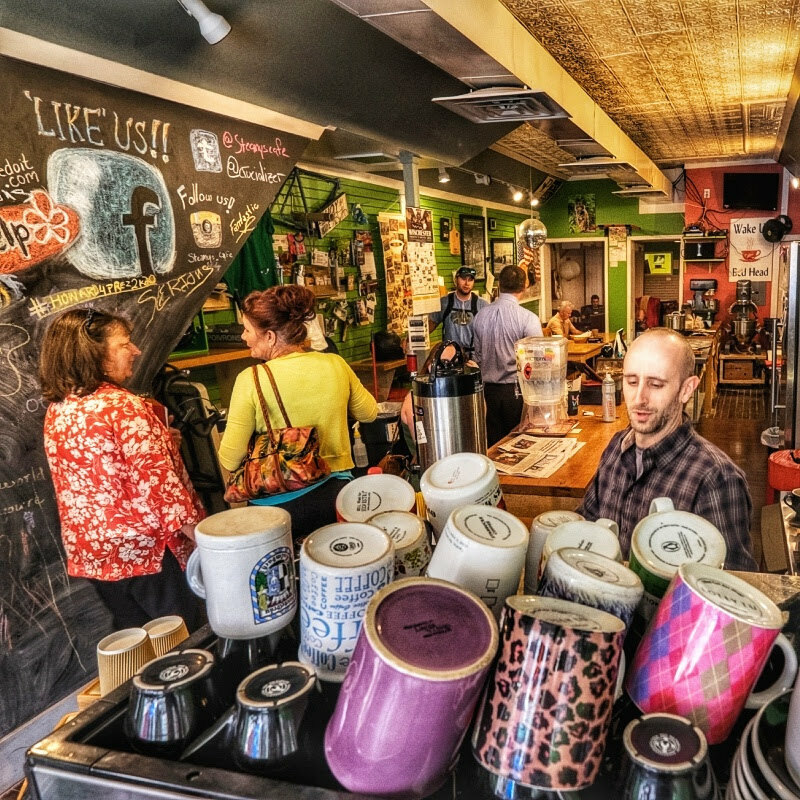 They offer their own special roasts of local award-winning roaster Lone Oak Coffee. Situated in what feels like an old garage, they’ve got a unique 2-story set up where you enter upstairs, then below is the seating, and live music area. And get this – they even have a record shop attached. Seriously cool. 250 Millwood Ave, Winchester, VA 22601. Free wifi. A friendly smile, free with every cup! Image courtesy Bro Bears Facebook page. 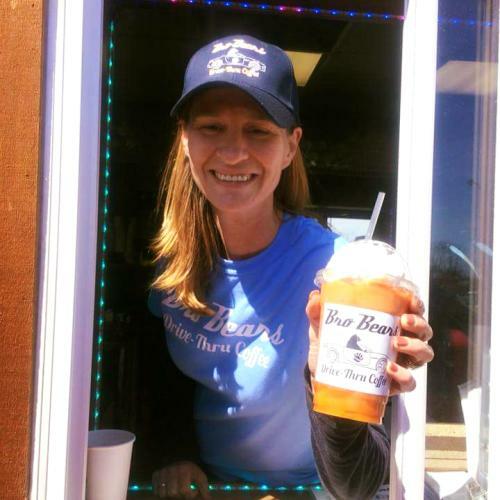 Great coffee, friendly smiles, quick service, teensy-tinsy workspace. 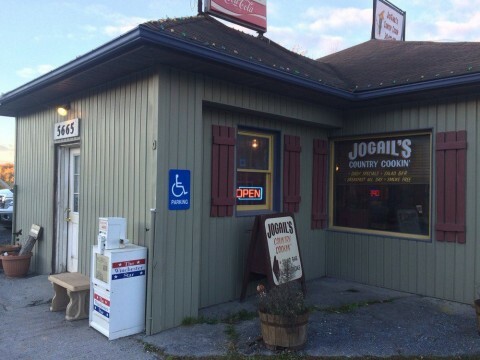 Owned by a disabled veteran and his wife (and Michigan natives, to boot), this tiny shop just off I-81 at Exit 315 turns out high quality beverages and has quickly become a local favorite. They offer keto coffee, a full espresso menu, locally made mini donuts, and cold drinks as well. You can stop and walk up to the window if you like, but most of their business comes from their drive-through. Tucked down in the parking lot of the Harbor Freight shopping center. 1141 Berryville Ave, Winchester, VA 22601. Steamy’s in Winchester. Image by Robert Harris for Winchester-Frederick County Tourism. Want some fresh homemade bagels? Yes, Steamy’s makes their own unique craft bagels in-house in very small batches. 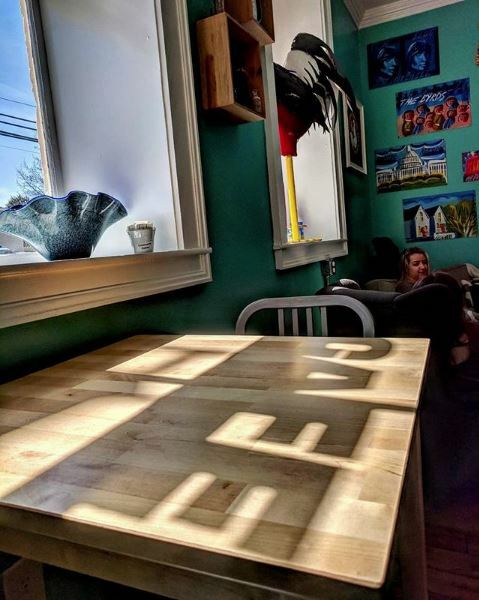 Their coffee is also expertly crafted, and they have an intimate, eclectic space that is exactly what you envision a college town coffee shop to look like. This is a great place to warm up (or cool down, depending on the weather) and watch the city go by. Located just steps from the Old Town Winchester pedestrian mall, this is a must for visiting on a chilly or drizzly day. 38 E Piccadilly St, Winchester, VA 22601. Free wifi. 0-60 Energy Cafe in Winchester. Image by Winchester-Frederick County Tourism. 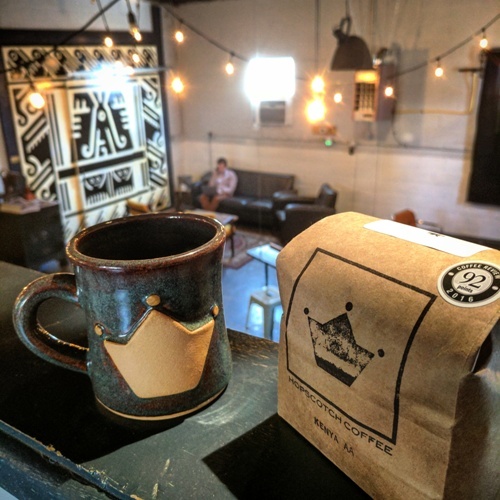 One of the more unique settings for a coffee shop; but don’t let the race car enthusiast interior or strip mall location fool you – this is some outstanding, artisan coffee. Their specialty is cold drip coffee, but they’ve also got some fresh made breakfast and lunch menu items. Make sure to check out their full grilled cheese menu! 170-11 Delco Plaza, Winchester, VA 22602. Free wifi. Espresso Bar and Cafe in Old Town Winchester. Image by Winchester-Frederick County Tourism. 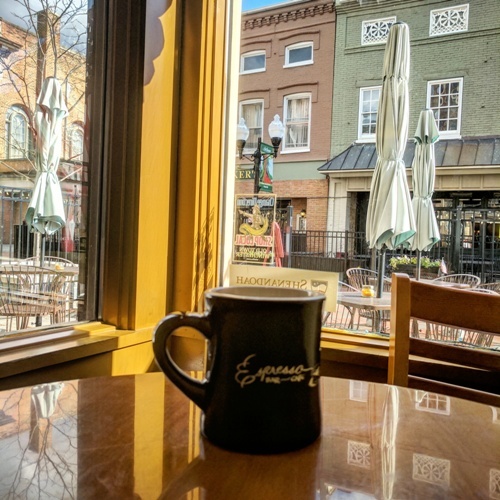 This modern coffee shop, ideally located right on the Old Town Winchester pedestrian mall, is reminiscent of some European coffee shops we’ve seen – clean but cozy, with local artwork adorning the walls. They’ve got a few breakfast items like a breakfast sandwich and, our favorite, the locally made and incredibly rich little Irish tea breads. Cuddle up and sneak out back to the secret garden (pictured above) to enjoy your cup of coffee, or sit out front and people watch on the mall. 165 N Loudoun St, Winchester, VA 22601. Free wifi. 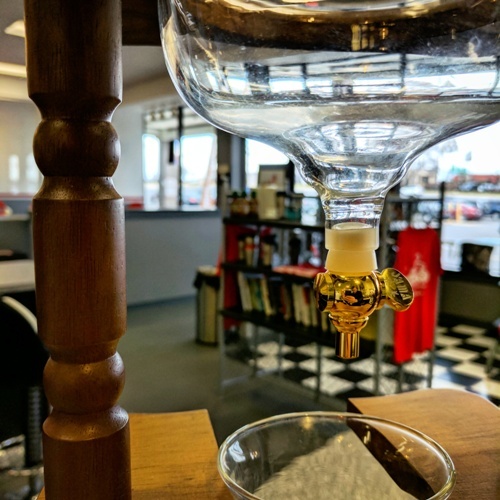 We just had to get this on the list – just about the opposite setting of a college town coffee shop, this local favorite turns out a two kinds of coffee – small and large. But boy, is this place hopping at 7am on a weekday. Heavily favored by locals, you’ll feel right at home no matter where you’re visiting from. The smiles are just as warm as the coffee, and the setting offers a nice view of the mountains and valley. Located just 20 minutes (but a world away) from downtown Winchester on Rt 50. 5665 Northwestern Pike, Gore, VA 22637. This made our list as, in addition to a great cup of coffee roasted by Orange County Roasters out of Orange, VA (drip as well as espresso drinks), their food is fresh and fantastic. Lots of specials, incredible homemade desserts, friendly and happy employees, and a California flair that somehow fits just right in our community. And for a little dose of philanthropy to sweeten your coffee, they’ve got a long and ingrained history of employing folks with disabilities and other barriers to employment. 3035 Valley Ave. #101, Winchester, VA 22601. Free wifi. Welcome to our very own Little Jamaica here in Winchester. Jamaican Blue Mountain coffee (the legit stuff; not the mixed down blends you see so often) is brewed up daily here. But this is a whole Jamaican cuisine experience – including an incredible jerk chicken, curry goat, beef ox-tails and even a variety of York Castle ice cream flavors. Just can’t do without your espresso? They’ve got a full espresso bar menu as well. Located right around the corner from the Old Town Winchester pedestrian mall, directly across from the beautiful Handley Library. 39 W Piccadilly St, Winchester, VA 22601. Free wifi. Hideaway Cafe in Old Town Winchester. Image by Winchester-Frederick County Tourism. This coffee shop originally truly earned it’s name. Why? Well, they started in the basement of the old post office building in Old Town, just across the street from Handley Library. In early 2018 they moved to a much more visible and accessible spot at the southern end of the Old Town Winchester pedestrian mall, very near the Shenandoah Valley Discovery Museum. They have become a fixture of local university students and evening shoppers and diners, and have begun offering sandwiches and other in-house baked goodies. 141 S Loudoun St, Winchester, VA 22601. Free Wifi. Bonnie Blue Cafe in Winchester. 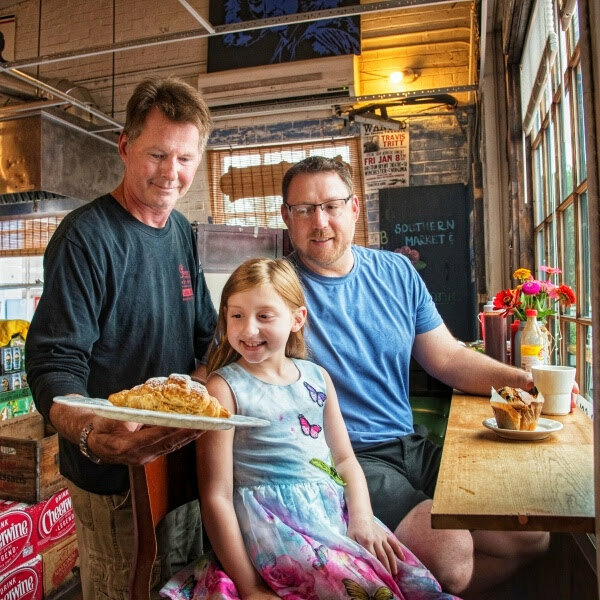 Image by Robert Harris for Winchester-Frederick County Tourism. This local hot spot for tourists and locals alike offers up very hearty cups of French-press coffee all day. You can find a variety of additional offerings here, including daily homemade pastries and muffins, a full lunch menu, and even local goods like hickory syrup, local eggs, and local brews. If you look closely, you can see the faded word Hopscotch on a counter near the entrance – this is where one of our other popular shops got it’s start several years ago. 334 W Boscawen St, Winchester, VA 22601. Free wifi. 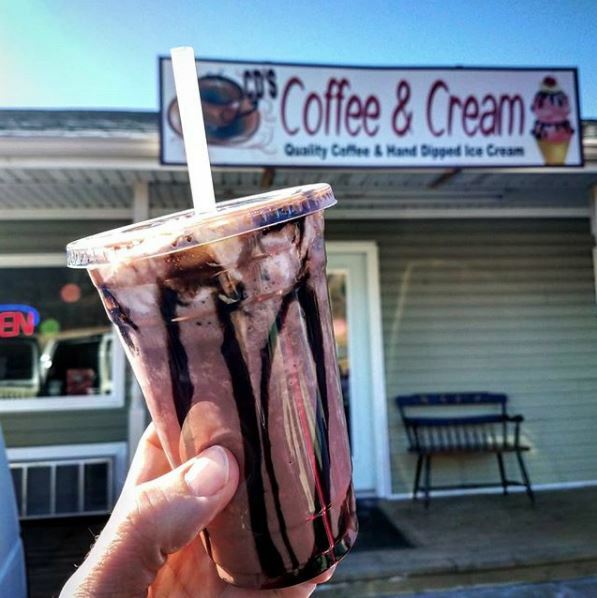 A chocolate covered cherry frozen coffee at CD’s Coffee and Cream in Winchester. Image by Winchester-Frederick County Tourism. One of Winchester’s newest coffee shops is in a fairly unexpected location. Situated in a small storefront on U.S. 50 about 5 minutes west of Valley Health hospital, this unassuming little combination coffee shop and ice cream parlor stays very busy year-round. They brew up an exclusive single origin Laos volcanic ash-grown light or dark roast, which is also available in whole bean (they grind for free on-site). You can also find shaved ice here in the summer. And don’t let the name fool you – CD’s stands for owners Craig and Diana, not the disc 🙂 Tip: try the chocolate covered cherry frozen coffee. 2953 Northwestern Turnpike, Winchester, VA 22602. Free wifi. * Disclaimer – no businesses paid us or gave us anything to be on this list – we just love coffee and our local businesses, as we hope you do when you visit!